The Xitan came in two configurations: the base Alpha 1 model and the Alpha 2, which added a 16K RAM board and a software package including the Zapple Text Editor and the Relocating Macro-Assembler. TDL quickly ran into financial difficulties. It reorganized and renamed itself Xitan. It’s first (and only) system under the new name was the General, which was aimed at the business market and featured a more user-friendly design than the Xitan. It also abandoned the S-100 bus architecture. The company’s troubles continued, however, and retailers’ orders were going unfilled. In October 1977, Management moved the company to Massachusetts in the dead of the night and without informing employees. 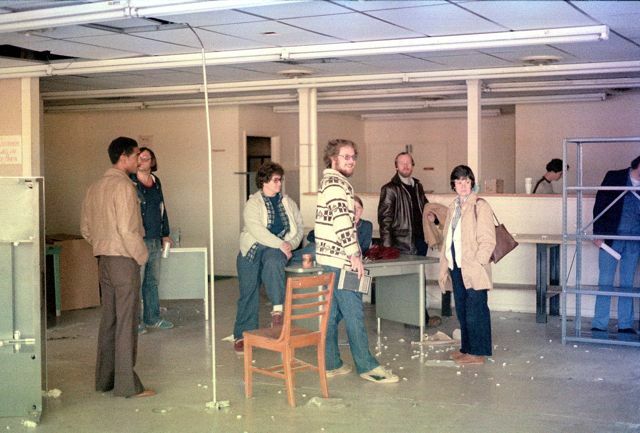 One of those employees, Joe Abelson, sent me this photo showing the empty office and bewildered employees the morning after the move. Thanks, Joe. If you want to know more about the TDL story, pick up a copy of Stan Veit’s History of the Personal Computer. It’s a great read. “April 29, 2010 at 3:12 am: Fresh out of college, I worked at TDL (aka Xitan) for about a year and a half. It was a pretty small startup, so I did a lot of different jobs: shipping/receiving, inventory control, printing and assembling manuals, and driving to the stores to drop off systems and collect money, which we so desperately needed. I even redesigned the company’s logo. After the owners had stiffed just about everybody, from the landlord to our SRAM supplier, they arranged a stealthy escape on a dark Saturday night, packing the company’s equipment and files into a couple of U-Hauls and driving north to an old Ocean Spray cranberry factory in Massachusetts, outside of Brockton, where they set up shop again. I was one of a few employees deemed essential enough to relocate to Mass. They rented cots for us and set up a little dorm in the old Ocean Spray accounting department. We’d be showering in the morning while the local employees arrived for work. Crazy scene.